Oct. 11, 2016, © Leeham Co.: The 11th 737-8 MAX is already on the Boeing production line at the factory in Renton (WA). Southwest Airlines will receive the first 737 MAX next year. Boeing photo. This one is for Lion Air, the Indonesian Low Cost Carrier that’s ordered 201 of the airplanes. Previous 737-8s that already are built are also for LCCs Southwest Airlines of the USA. The initial line up of customers scheduled to receive the MAXes next year is in stark contrast to decades ago when the names on the sides of the airplanes would be American, United, Lufthansa or Japan Air Lines. It’s illustrative to the changing airline industry. Southwest will get the first four 737-8s that are now serving as test airplanes, said Jay Culbert, a manager at the plant. Culbert, who was the guide for a tour arranged by Boeing supplier SME for about 200 people, said the first MAX will be delivered in the second quarter next year. Market intelligence suggests it actually could be in March, seven months ahead of the schedule announced when the program was launched. Whether it’s March or in 2Q, the ahead-of-schedule scheme is a welcome change for Boeing, which delivered the 787 and 747-8 years late and in an industry where Airbus, Bombardier, Mitsubishi and the new entrants COMAC and Irkut are running years behind in their new and derivative airplane programs. By the time the first MAX is delivered to Southwest next year, Boeing may have upwards of two dozen airplanes completed. The MAX, of course, is the latest and the last in a long line of 737s. The original 737-100 entered service with Lufthansa in 1968. It was shortly followed by the 737-200 to United Airlines. Together, these are the first generation 737s. The next series, the -300, -400 and -500, with a new engine, the CFM56, ultimately became known as the 737 Classics. The -200 became the baseline -300. The -400 was a stretch, a simple fuselage plug carrying more passengers. The -500 was a shrink. The Next Generation -600 (replacing the -500), -700 (the -300) and -800 followed in 1994. Although the -700 remained popular at the time, the -800 eventually became the preferred choice among airlines. The NG had a new wing and upgraded CFM engines. Boeing stretched the -800 to create the -900, an unsuccessful model that sold only 52. Carry only some 18 more passengers, this simple stretch traded passengers for range. The -900 was superseded by the extended range -900ER. While sales increased, it continues to account for less than 10% of Boeing’s 737 sales. Boeing launched the MAX in July 2011 after it got word that Airbus was about to land a huge order from American Airlines for A319ceos and A321ceos and neos. Boeing officials pooh-poohed the neo until then as something the market really didn’t want and simply a poor attempt by Airbus to “catch up” to the 737. In the meantime, Boeing was dithering whether to launch a re-engined 737 or an entirely new airplane. The pending American deal forced Boeing’s hand. The MAX was born. Culbert said the new CFM LEAP-1B engine is 12% more efficient than the venerable CFM56 it replaces. Boeing gets another 1.5% fuel efficiency from the Advanced Technology Winglets and yet another 1.5% from the redesigned, 787-like tail cone. This grosses about 15% of the fuel efficiency gains (there are some additional aerodynamic clean-ups for about another 1%). Against this is an offset for additional weight and drag from the heavier engines and pylons. The MAX cockpit mimics that of the 787, with fewer and larger flat screens. Boeing’s Renton factory, the only place where 737s are assembled, current churns out 42 NGs a month. This moves to 47 next year, 52 in 2018 and 57 in 2019. 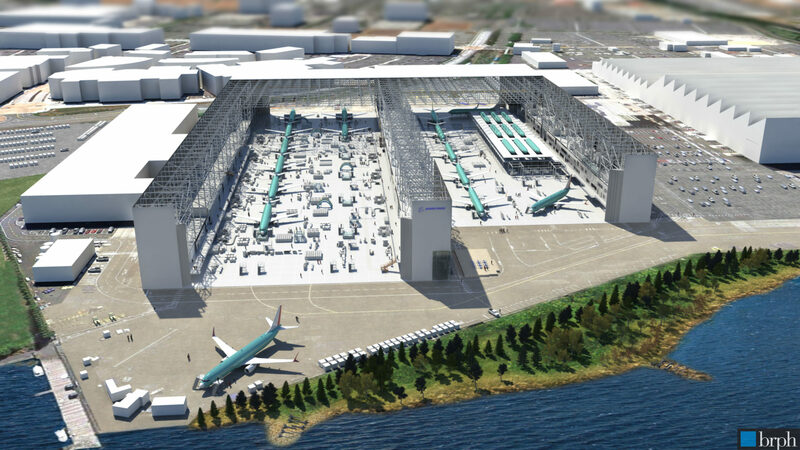 In this artist rendering by Boeing, the new third assembly line, for the 737 MAX, is seen in the center between the East and West lines. click on image to enlarge. Boeing is considering additional rate hikes of 60-63 a month, the latter being the capacity of the factory. The MAX is currently being assembled on a new third assembly line sandwiched between the East and West lines. These two are the legacy lines with the current rates. The new Center line, for the MAX, will take several years to match the rates of the mature lines as workers from the labor union, IAM 751, learn the differences between the NG and MAX and become as efficient for the new airplane as they are with the old. Lean manufacturing and ever-increasing efficiencies cut production time for a single airplane to 10 days, less than half what it was only a few years ago, Culbert said. On Day 1, an empty fuselage shipped from the Spirit Aerosystems plant in Wichita (KS) enters the Renton plant. Wiring is installed on Day 2 and hydraulics on Day 3. Culbert said the fuselage is lifted by crane on Day 4, rotated 90 degrees. Wings are mated to the airplane, a six hour process, along with landing gear. On the third shift of the day, the airplane is again rotated 90 degrees. Beginning on Day 6, the final assembly process begins, with the passenger interiors, galleys, lavs, overhead bins, etc. installed. Engines are attached on Day 8. The airplane is ready to roll out of the factory on Day 10 for test flights. Painting is typically done at Boeing Field, although Renton Airport has two paint hangars, Culbert said. The MAX will be the last of the long line of 737s. There are nearly 3,500 orders for the airplane, but the MAX 7 proved to be a niche model that sold only two three customers in small numbers before Boeing revamped the design. Instead of being a derivative of the 737-700, it’s now a shrink of the 737-8 with two more rows of seats. The MAX 9 is officially selling more poorly than the 737-900ER, with about 290 acknowledged sales, but this is deceiving. LNC believes the sales are closer to about 420; Boeing no longer discloses the breakdown between sub-types. But the Airbus A321neo is outselling the 9 MAX by about 4-to-5 to 1, depending on the timeline and which Boeing number is used for comparison. Regardless, Boeing is studying stretching the MAX 9 into a MAX 10, adding 12 more seats. The final configuration remains unclear. A program launch could come by the end of this year. The MAX 10 is Boeing’s effort to staunch further defections by 737 operators to the A321neo. When will a replacement for the 737 come? This is a matter of intense speculation. Conventional wisdom, and Boeing, suggest entry-into-service will be about 2030. Behind the scenes, Boeing is said to be targeting 2027. Back up seven years for development, and a program launch would be 2023 to as early as 2020. The latter is just three years after EIS for the MAX. Any news on the driver of the project the the leap B ? That wont be good for cashflow to have ‘upwards of 2 dozen planes completed’ and unexpected engine problems to appear ? Of course most of the efficiency gain comes from the extra 8 in fan diameter. I talked to Boeing folks around the time the 737-900ER came online. Boeing specialists at that stage had reservations already because of performance constrains and the extra empty eight the 900ER introduced. E.g. the extra door introduced a lot of weight but was required to get above 180 seats, if I remember well. Is it known if Lion will take any -9s? Those look like -8s to me. I think Lion Air is expected to take a large number of -9s. (After all, the majority of its currently fleet is the -900ER.) But the -8 is the only model in production yet. However, they’ve been taking deliveries of many more -800s than -900s for the last couple of years. They also have a sizeable order for A321neos. And ExIm financing guarantees. Thats all good ?,or is Boeing going to find another guarantor? The 2017 deliveries for Lion Air are indeed MAX 8s. The MAX 9 (regardless of who ordered it) doesn’t appear until 2018.
and the 1.5% aero gains may be a fringe benefit and not the core reason. Any other potential issues for redoing the tail ? Ease of manufacture perhaps, or better access for APU maintenance could be an issue. The tail area of the current 737 dates from the 1960s era 737-100, so this may be the opportunity to rework it. The boundry layer at the tail is so thick that reshaping it provides little benefit…But airframe or engine OEMs would spend hundreds of millions for 1.5% gain — huge in the competitive NB market against the A320, so I doubt Boeing would have ignored it for so long. So maybe this is just optimistic marketing arithmetic to get to the advertised 15% fuel improvement for the MAX. Have you done the weight and drag analysis to make that statement? Often find it interesting to read comments from folks who “feel” that a change is nothing more than a optmistic marketing approach. Maybe all the changes are optimistic, but they sold 3,500 frames to “hopefully optimistic” customers. By the way there are performance penalities that Boeing would have to pay if they failed to hit the performance targets. 1.5% from anywhere in a 50 year design is an “outstanding” effort. Considering Boeing has been performing mods annuanly on the program since 1997 and each of those programs have addressed a host of changes. Getting to 13-15% in this config was a mjaor task, which all did not come from the engines. Maybe the tail section played a part maybe it didn’t? I don’t know but they must feel confident that the program is on target or they would not have pulled up deliveries. Or maybe that too is a marketing play? I think it’s time for you to go out to Renton and share your thoughts on the next rounds of mods because you seem to have such a wonderful understanding of your optimistic feelings about the program’s inability to meet performance targets. You better get out there quickly and perform your evaluations of those currently produced frames to make sure all of them are not just full of optmistic marketing ploys. These other items get lost in translation so it becomes a benefit ‘all from the winglets” Same goes for tailcone, other changes at the empennage as well as the reshaped tailcone. Nasa has been doing Boeings work in the research area to allow tails to be smaller in airplane families, rather than the one (over) size fits all. The article stated 1.5% gain from redesigned tail-cone and they did not provide any aerodynamic info or backing either. The 1.5% improvement is very large for an airliner, equivalent of an expensive engine PIP and would save $ millions over the life of an aircraft, billions for a large fleet. I’m sure there is some aero value, but if there was that much of a gain to be had, as I suggested, it would have been done long ago for the competition with with Airbus. Also I believe Boeing has indicated the tail-cone design also reduces the number of joints, so there may be manufacturing advantages also. Im sure they get some benefit from it. This nose cone design is optimised for the air flow produced by larger diameter engines I would think. The 737 MAX is growing on me aesthetically. What nose optimization for 737-Max? Same nose since 1960s, maybe even 1950s if you consider 707/727/737 the same lineage. Even same flat windscreen ? You have to keep in mind that this is coming from advances made on the 787, which came seven years after the 737NG. All aircraft manufacturers still have a great deal to learn about aerodynamic improvements. This is particularly obvious in Formula 1 where cars are constantly upgraded, even during the season, because they keep discovering new tricks all the time. Computers are still not powerful enough to extract the maximum potential from CFD (Computational Fluid Dynamics). It’s the same here, where progress has been spectacular in recent years. In short, I think we can believe those numbers for the tail cone and winglets. And if they come short I don’t expect it to be by more than half a percent in total. Nothing Boeing or Airbus produced after the original 737 had a tail-cone that looks like the current 737…so everyone knows the 737 was not optimal, yet Boeing kept it for decades. So the gain cannot be huge for the tail redesign. Yes aerodynamic and CFD is getting better but not by leaps and bounds in a few years. First, it is important to understand that this solution had to be implemented on the Dreamliner first. Second, this is not a quick fix that can be implemented overnight. There is more involved here than simply replacing the tail cone. It’s the kind of development that needs to be part of a major makeover for the entire aircraft, like the MAX is. We also have to take into consideration the high production rate of 42 aircraft per month, which does not easily accommodate major changes. Third, perhaps Boeing intended to launch the NSA instead. That being said, tail cone designs are as varied as winglet designs, and aerodynamicists are still struggling to find the ideal solution. I believe there was, and still is, room for improvement; and in this case Boeing exploited that possibility very well. Boeing can say that the MAX is 30% more efficient than the Neo if they want, even if it is not true. But they cannot say that the MAX is 15 % more efficient than the NG if it isn’t. The 787 tail-cone is hardly radical, it is much like the 757 or 767, and the the A320/A330. No big tail-cone advantage for anybody! In fact, I believe that the 747 tail shape was never changed because the boundary layer is a few feet thick there, thus the underlying tail shape is not as critical for form drag. The tailcone changed to a more rotational symmetric body. While the nose was drooped and integrated the cockpit area better. Seems to integrate better with airflow around the wingroot. The 777 ( tail only ) and A380 started this trend. Seems to integrate the flow around the front fuselage better with that around the wing root. Wonder if we will see other “knick knacks” like the step on the A350 wing root fairing in continuation of the wing root trailing edge. All Lionair MAX are/were in the 737-9 order book. The Lionair 737-8s shown above are the first visible, long denied, cracks in the 737-9 backlog. The line, “Boeing was dithering” aptly describes Boeing’s snails pace in making decisions for quite a few years now. It took the A320NEO being launched to get Boeing’s attention. They also lost more sales to Airbus by not upgrading the 767 to a 767MAX and Airbus upgraded the A330 and have had the only game in town and at a low price. The 767 line is still open and with some modest upgrades such as new engines and a weight reduction program, it would have be well received by airlines looking for a small wide body at an unbeatable cost. Now we wait to see what offering they will have for the new MOM. They also lost more sales to Airbus by not upgrading the 767 to a 767MAX and Airbus upgraded the A330 and have had the only game in town and at a low price. You’re mixing up and/or forgetting a few things here. Namely, that the A330CEO had effectively killed the 767 PAX already – which was the reason Boeing launched the 787 to begin with. There’s no reason to believe that a 767MAX would have done better against the A330NEO than the 767 did against the A330. Plus: The overlap between the 787-8/-9 and the 767 is much bigger than between the A330NEO and the A350, so a 767MAX would’ve been a bad idea from that perspective as well. Anyway – water under the bridge. Airbus progressively upgraded the A330 over the years adding range and lower fuel consumption,but Boeing did little for the 767. An upgraded 767MAX could have also covered the market for the defunct 757. It just seems for a very little cost compared to a new plane, the 767MAX could have gained more orders for small widebodies with a 5000 mile range. I don’t see the A321NEO as a true 757 replacement when used for transatlantic flights or flights to deep south america. I am confused, because one (2) seems the contradict the other (1). You can only get close to 420 orders for the -9 if you assume all 201 of Lion’s MAX order was for that model. Clearly now, not all of Lion’s order will be delivered as -9s. The real question is, how many will? As I noted above, they’ve been switching many of their -900ER orders to -800s. Yes, and Scott has even acknowledged this. But he still maintains that there are 420 overs for the MAX 9. Unless he has changed his mind since. That is what this forum is all about after all. I myself keep changing my mind all the time because I learn something new on LNC everyday. @Stealth and others: Boeing acknowledges 290 Max 9 orders to LNC. We estimate about 140 of the 201 MAX orders by Lion Air will be MAX 9, based on its current existing fleet and NG order mix. Scott, I have been scouring the internet for months for available, current financial information on Lion Air–without success. They were also supposedly under some sort of recent governmental ban on adding new routes–apparently beccause of operational problems. My concern is that Boeing and Airbus could one day in the near future wake up to “a house of cards” in Lion Air. As you undoubtedly know, its A and B order book is massive–on the order of hundreds of planes from each. Any thoughts on all or part of this? IMHO, given the huge backlogs at Airbus and Boeing, even if Lion went bust tomorrow and didn’t take another plane, neither OEM would be materially affected. you have to have a portfolio of orders from all participants in an expanding market. the demand is there. If one participant goes bust the demand will redistribute. If OEM A supports competitor X while OEM B supports participant Y you are open to political shenanigans. @Montery: You are correct about the absence of financial transparency. LionAir has been on our “storm warning flag” list for three years in part because of this. Scott, sorry to harp on about this, but IMHO, it’s critical in trying to understand Boeing’s position on the whole MAX 9/MAX 10 situation. If Boeing have told you they have 290 orders for the -9, what makes up the difference to get to your “about 420”? Are you suggesting that all of Lions order were in fact booked as -8s and the difference is your estimation of how many Lion will actually take as -9s? @Stealth: LionAir’s MAX orders were booked as TBDs, according to Ascend. Then I went to the current, operating fleet of 800s and 900s, and the existing orders for 800s and 900s, did the math and applied the ratio to the TBDs. “Culbert said the first MAX will be delivered in the second quarter next year. – When the programme was launched I did not understand at the time why it would take so long to develop a “simple” upgrade like the MAX, even though Boeing acknowledged at the time that they were playing it safe. So I wouldn’t consider this an exploit. – Scott, I have difficulty to reconcile the above with the fact that “the new Center line, for the MAX, will take several years to match the rates of the mature lines.” Perhaps you could explain how the phasing out of the 737NG will unfold concomitantly with the ramping up of the MAX. For I don’t know when exactly the NG backlog will be depleted, and how and when the transition will take place. For example, if in 2019 the rate is at 57, is it going to be a mix of NG and MAX? If I am not mistaken they still have about a thousand NGs to deliver, which represents only two years of production. This is important for me to understand because I need to evaluate when it might become too late to launch the NSA. Winglets and wing-engine integration with bigger diameter fan. last but not least the limited fly by wire system. Airbus just added new engine and tweaked fly by wire. Did I get this info right in that MAX will have their own dedicated FAL line and _not_ just be intermeshed on the existing lines ? @Normand: The timeline for launch-to-EIS of the MAX was driven by the engine development. The NG is supposed to phase out about two years after EIS of the MAX. I was not aware of that. It certainly explains, at least in part, why it took so long to develop the MAX. It may be a good thing in the end because it has given the engineers more time to mature the design before EIS. When things are rushed to beat the competition, like the Galaxy Note 7 obviously was, it can lead to unpleasant surprises, like exploding phones. This makes sense, for the backlog is approximately 1000 NGs and the current rate of production is approximately 500 a year (2 X 500 = 1000). This means that early in 2019 the three lines in Renton will probably be dedicated to the MAX only. The question is this: At what rate will the MAX be produced in 2019? The projections are 57 a month in 2019, and that represents a very fast ramping up indeed. I was wandering if those numbers will have to be revised for the MAX, because I imagine that to go from o to 57 in only two years will be quite a challenge. That being said, the two planes remain quite similar. I hope it will be possible to achieve this kind of rate for the MAX around 2019 because Boeing will need all the cash it can get to develop the MoM and the NSA.